There are millions of ways to Pop the Question! At Rivers Jewellers We’ll Do it Your Way! You want to create a beautiful bespoke engagement ring secretly… You can! An engagement ring is a symbol of a lasting love and of course it’s the ultimate in romantic gestures to create a bespoke engagement ring just for your fiancee! The process is simple and rewarding, every design choice is yours to make. Why not check out our Design page to learn more about the process and the options available to you? You want to create your engagement ring it together… Absolutely! Well after all the next phase of your life is a walk together, side by side, so why not design the engagement ring together too? Why note check out our design gallery? An ever changing gallery filled with jewellery we have made for clients just like you! It may give you some inspiration. Selecting your perfect gemstone and proposing with it alone allows you to have the best of both worlds! You get the surprise and then the two of you can enjoy the journey of creating your engagement ring together. We love to help our clients choose the gem of their dreams for their fiancee! Pop in store and get the ball rolling today! You have your own Stone already… No Worries! We have a stunning selection of rings ready for your stone or perhaps you’d prefer to have a setting custom designed especially for it! What ever you prefer we can give your stone the new home it deserves. 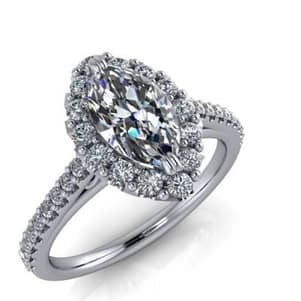 Below are some of our exquisite engagement rings! You may just find your dream engagement ring all ready for your fiancee’s finger! However You choose Your Engagement Ring, Rest Assured Our Help and Expert Advice is Always Available. Daring Black Diamond Solitaire Engagement Ring in White Gold.